If your business involves the use of hazardous waste or chemicals, you do not need to be reminded of maintaining a safe work environment. Protecting staff and visitors from harmful accidents should always be your company’s main priority, and a big part of that means knowing how to properly store these materials. 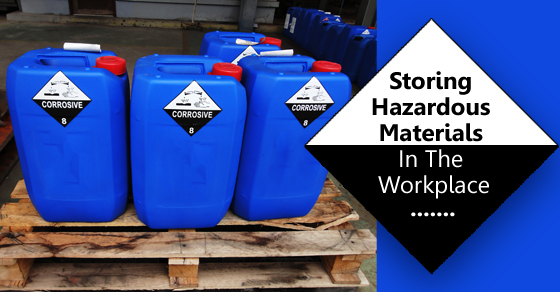 One of the most common problems business owners face, however, is knowing what types of chemicals can be stored safely together. With countless kinds used in the manufacturing industry, determining where to place these items can be quite the challenge. As a general rule of thumb, keep similar chemicals together and ensure enough distance is between those which are incompatible. When working in close vicinity to dangerous combustibles, flammables, and toxic agents, this truly is life-saving advice! Remember to follow the additional tips below to prevent accidents before they start. These must be metal to prevent container corrosion and labeled to avoid mishandling mistakes. The thing to remember about these liquids is the vapor that forms above them. Keep the cabinets away from doors and limit the total quantity to 50 liters in any given space for safety’s sake. This serves two purposes; first, keeping containers out of the way is necessary for preventing spills and other hazardous circumstances that can quickly arise. Second, your workplace needs to have unobstructed escape routes in case of an emergency. OSHA regulations are very strict when it comes to this, and for good reason. Be sure to keep a copy of the MSDS (a document consisting of all the data about a material) on hand at all times, and triple-check that the item in question is being stored according to these safety guidelines. This is one field where there is no room for error. Lives are always on the line, so always remember to inspect containers for proper documentation. As the manager or owner, it’s your responsibility to train employees on the right way to handle and store hazardous workplace materials, as well as consistently monitor staff to ensure they are following the company’s rules. While an OSHA violation is bad enough, accidental injury or death is far worse!